I have made a goal to post to this blog at least once a week this year. This could be tricky, because I still don’t have anywhere near the time and energy I’d like to spend on genealogy research. I can start, though, by admitting I barely know what I’m doing with the Family Finder test I had done with Family Tree DNA a few months ago. I’ve looked at my matches a number of times, but the nearest ones are, of course, 2nd-4th cousins, and so far I have no idea how any of them are related to me. Very few have even surnames listed, let alone a family tree. But then, I know my surname list is not complete, and I still need to finish preparing a version of my family tree for posting, so I can’t complain too much. I’ve been interested in DNA since 10th grade biology class and making Punnett square after Punnett square. I found the whole genetics thing fascinating, and might have pursued a career dealing with genetics if it wasn’t for all the chemistry. I enjoyed my 11th grade chemistry class, but I was definitely not very good at it. I felt like a had a pretty good understanding of the basics, though, so it took me a bit by surprise that I’m not picking up whatever it is I’m supposed to be doing more easily. Right now I’m trying to figure out where to focus my what little time and energy I have. Should I work on collateral family research so I can better figure out how my matches are connected to me? Should I study up on the science so I can better understand how to use the chromosome browser? Is there some other piece of the puzzle I’m missing entirely? One year ago tomorrow, I started a new job. The last time I posted here I mentioned “something nongenealogy-related” that I was dealing with, which keeping me from the blog. That something was searching for a new place at which to earn a paycheck. What I didn’t realize was that I would find such an awesome job. It has plenty of challenge and there are new things to learn and understand every day. However, I haven’t had much of my brain left over for genealogy work. I’ve done a tiny amount of client research (yay!) and an even tinier amount of personal research in the past year, but that’s it. I did attend a local genealogy conference in October and it was inspiring, but inspiration isn’t quite enough when there’s not anything left in the tank. At some point during the day today I felt something I haven’t for a long time: the desire to get home and do some genealogy! For starters, I had to copy all of my documents from a USB drive to my new Macbook so I could back them up on my new backup drive. Thank goodness for the USB drive, since I recently lost the Macbook I bought just last summer to an orange juice incident. Right now I’m attempting to catch up a little with my tree on Ancestry.com. 728 record hints? Oy. I have a really bad feeling about the National Genealogical Society Home Study Course I purchased in January of 2012 and haven’t even started yet thanks to the crazy time. I have a really good feeling about attending the FGS Conference next month. I can’t wait! Yes, yes, you’re right. It has been over two months since I posted, and I can’t believe it either. There really is a good reason, something nongenealogy-related I’m dealing with (that I learned about the very day after my last post), but I’m hoping to get back into the genealogy swing soon. Back before that happened, I had started the process of joining my local and the Second Life chapters of the Association of Professional Genealogists (I had joined APG itself back in August, if I recall correctly). I was asked to give a presentation to the SL chapter about the Boston University certificate program, a presentation which I greatly enjoyed putting together, and a lot of fun giving. It kind of made me wish I had some more presentations I could put together! With no further ado, the presentation is below. This caveat is included within it, but please note that any opinions given are mine alone. The combination in the title is not one I’d recommend, but this is a strange January in Minnesota, and while there was too much snow to make it easy to trudge around cemeteries today and see every stone (some had icy snow on them), it definitely wasn’t a complete hindrance. Today was my last day of a 10-day stint off from work, and my parents and I drove about 45 minutes to Chisago County, which is where one-half of my dad’s Swedish immigrant ancestors landed in the 1850s (one family emigrated in 1853, but we don’t know for sure where they were between then and 1857, when land was purchased in Chisago County; one story has them in Iowa for a time) and 1887. We hadn’t called ahead to see if we could access the historical society, but had a few cemeteries to look at (mostly for my benefit because my parents have been to them, but I hadn’t). First, however, we headed to the Recorder’s Office in the Chisago County Government Center to see if we could access old vital records that aren’t available at the state level. Access was pretty easy, as long as we wanted records more than 100 years old (this isn’t quite the policy at the state level, but was sufficient for what we wanted today). They have tall tables where you can stand and view the books, so we requested the book that included the marriage record for my great-great-grandparents Frank Strum and Minnie Tolberg, and the book that contains the marriage record for Minnie’s parents, Alfred Tolberg and Mary Peterson. The book with Alfred and Mary also included the marriage record for Alfred’s sister Sophia and Julius Johnson. The only hitch? They don’t allow digital photography, even without the flash. So, today I was able to utilize the transcription skills I learned during the earliest part of the BU genealogical studies certificate program. However, there are lots more records we’d like to obtain, so it might end up being a few trips to get them all, with the writing and standing. Now I just need to get the ones from today typed up. Most of the cemetery visits today were for my familiarity of where they are, but there’s one where I recently found a “Mr. and Mrs. Strum” listed with no first names or dates (the county historical society has done great work documenting the many county cemeteries), so we thought we’d see if we could find the stone(s) to see if they might be Frank’s parents, Carl and Stina, whose graves have so far not been located, but their death certificates indicate they were likely buried at this cemetery. We found where Mr. and Mrs. Strum are buried, but there are no stones for them. 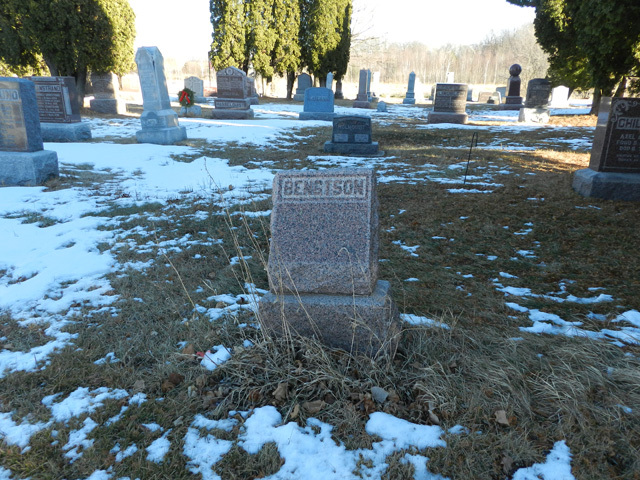 In the photo, they’re between the Bengtson stone and one behind it. My mom and I found someone in the office of the church that manages the cemetery, and it turns out he serves on the cemetery committee. We wrote down the info for the graves we’re interested in and who we think might be in them along with their vital info, and he agreed to look into their records to see if there’s more information about who is buried there. Even records of when the burials occurred would help confirm their identity. It would be great to have found Carl and Stina, and then we can look into adding markers for their graves. I haven’t been “doing” genealogy all that long, really only deciding to take a stab at it last April. So, I didn’t have any 2011 goals, though I accomplished quite a lot for my first nine months of genealogy. In 2011 I started this blog, I worked like mad on an Ancestry.com member tree, attended my first national and local genealogy conferences, and started and completed the Boston University Online Genealogical Certificate Program (I’m patiently waiting for the verification I actually earned the certificate). Somewhere along the line I discovered that staying away from genealogy, for the most part, because it was my mom’s thing was one of the silliest mistakes I could have made. How much time I lost! But maybe it was meant to be this way, because if I hadn’t discovered my passion at the time I did, perhaps I wouldn’t have realized it’s what I want to do professionally. Right now I’m nearing the end of 10 days off from work. I haven’t accomplished everything I wanted to, but I did do at least a couple of things that were part of my January 2012 goals. Join my local APG chapter (I also joined the Second Life chapter, which wasn’t part of my plan, though I had been thinking it might be fun to get involved with the Second Life genealogy community). Order the National Genealogical Society‘s Home Study Course. You’d think I’d have had enough education for a while, but while the BU program is pretty rigorous and I think I did pretty well, it also proved to me that there are some deficiencies in my experience and knowledge base. I actually ordered this at the end of December, received it a few days ago, and I’ve read a large part of Lesson 1. Come up with a name for my genealogy business. Edit my APG profile to be listed in the directory, once I actually receive my BU certificate (assuming I do). I have no idea at this point what to write for the biography section. Start working on business stationery templates. Start working on an idea I have for making “click-and-type” macros for census citations in Microsoft Word. I know it can be done because I’ve done this sort of thing for my job, I just need to do it. Attempt to get through the first lesson or two of the NGS Home Study Course. Once I have a bit more experience with archives and that sort of thing, sign up for ProGen. Work on my “real” tree in RootsMagic. I’ve started this, but because I’m trying to document and include digital images of everything as I go, it’s going to take a while! My Ancestry.com Member Tree is very documented, but I’m not going to add things there (for the most part, anyway) that aren’t available on Ancestry, like I will in my “real” database. Blog more. I don’t want to set a random number of posts I can’t live up to, but overall I’d like to post at least twice a week. Add surname pages to this blog. Start delving into client work. Complete the NGS Home Study Course. I’d love to attend one of the summer institutes, though I’m not sure it’ll work out financially. You can’t begin to imagine how sad I am that I can’t attend RootsTech 2012. Perhaps someday I will have a job that doesn’t keep me from traveling January to May. If that happens, I could attend RootsTech AND spring training, which I’ve been wanting to do for a number of years. Not to mention SLIG and the NGS conference. Why are so many great genealogy (and baseball) events scheduled for these months? In any case, I do love me some technology. Though I’m somewhat more cautious than I used to be, I am often an early adopter of new electronics, and though I’m not as plugged into social media as so many are, I read a lot of it and participate when I can. This meme started by Thomas MacEntee at the GeneaBloggers blog is right up my alley. I have downloaded one or more apps to a Smart Phone or similar device. I belong to a genealogy society that uses social media. I have added metadata to some of my files and digital photos. I have utilized an API from a genealogy-related application or website. I have taken a DNA test related to my genealogy research. I have used the FamilySearch Research Wiki. I have developed a genealogy-related app for a Smart Phone or similar device. I have made one or more contributions to the FamilySearch Research Wiki. I have attended a genealogy webinar. I have organized and administered a DNA testing group related to my genealogy. I have one or more genealogy-related websites which I run and administer. I have created a screencast or video related to genealogy and posted it at a video sharing site (Vimeo, YouTube, etc.). My dad would like to think I grew up eating lutefisk for Christmas like he did being 100% Swedish, but for better or worse, I did not. But I really don’t remember what I did have. We spent most of my childhood Christmases at my Grandma and Grandpa Wood’s, and I’m sure we had great holiday feasts, but I don’t remember anything particularly special or ethnic or anything. Well, okay, the poppyseed rolls were pretty special and might be of Eastern European extraction. My Great-Aunt Mary, whose family was from Czechoslovakia (she was my Grandpa Wood’s sister-in-law; I’m not even a little Czech or Slovak), made them originally. I seriously need that recipe. One of my uncles makes them occasionally, but there’s never enough to go around. Particularly as I’d like all of them to make it around to my tummy. As time went on and we didn’t go to see my grandparents for a whole week around Christmas, my parents, my brother, and I ended up with a tradition of lasagna for Christmas Eve supper and often Cornish Hens for Christmas Day dinner. We did have lutefisk once. My Grandpa Strum made it one year. I’m pretty sure I was already an adult, and I’m not sure if my brother was still in Minnesota then. It wasn’t terrible. Really, it wasn’t so bad, but I seem to recall it was kind of rubbery or something, and my dad assured us later that Grandpa hadn’t made it quite right, and it should have been better. Maybe someday I’ll try it again. So, I was just saying on Twitter yesterday that I probably wouldn’t be able to blog until the BU program is over (the 19th), but then I saw this Advent Calendar thing and figured that with some holiday prompts, I might just be able to do at least a few posts this month. The timing of today’s topic, the Christmas tree, is kind of amusing to me because I’ve been pondering over the past week or so whether to get a tree. This will be my third Christmas in my own home, and so far I haven’t had a tree at all. This is in part because I haven’t figured out where to put one, another part because I can’t decide between artificial or real, and a final part because I have a tree-climbing cat. This photo is from when she was just two, and she’s seven now, but she still acts much the same as she did then. 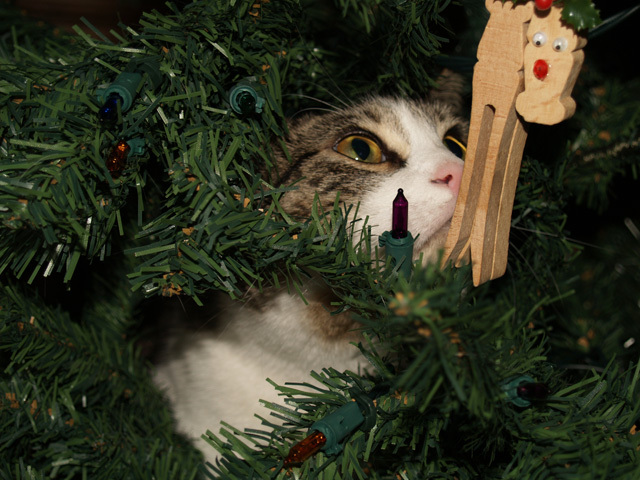 I fear for any tree in her presence. Growing up, my parents had an artificial tree. I don’t recall ever having a real tree at home. My mom was pretty much in charge of all decorating, though my brother and I probably helped from time to time. I know I’ve helped with the trickier items, like lights, more than once. 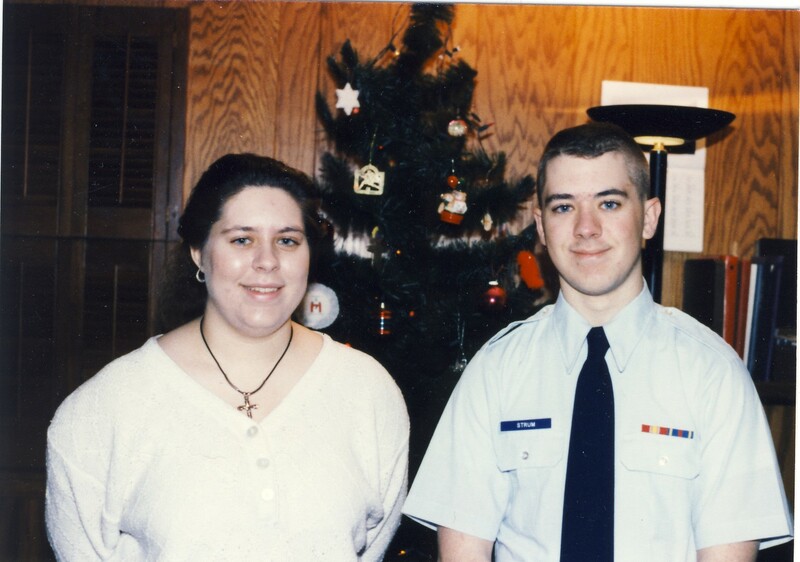 Below is a photo of my brother and me in front of our tree the last time he was home for Christmas, in 1994. He was still in Texas with the Air Force then, and in the summer of 1995 he was stationed in Alaska, where he’s lived ever since. My maternal grandparents (Wood) always had a real tree when I was a kid as far as I recall, and my memories are of tall trees that they might have cut from their own property, but perhaps not. My grandpa was a logger, so who knows where they got the trees? Perhaps my mom will comment and weigh in on where the trees came from. What I do remember was that they had a real tree despite my grandma being allergic to it. 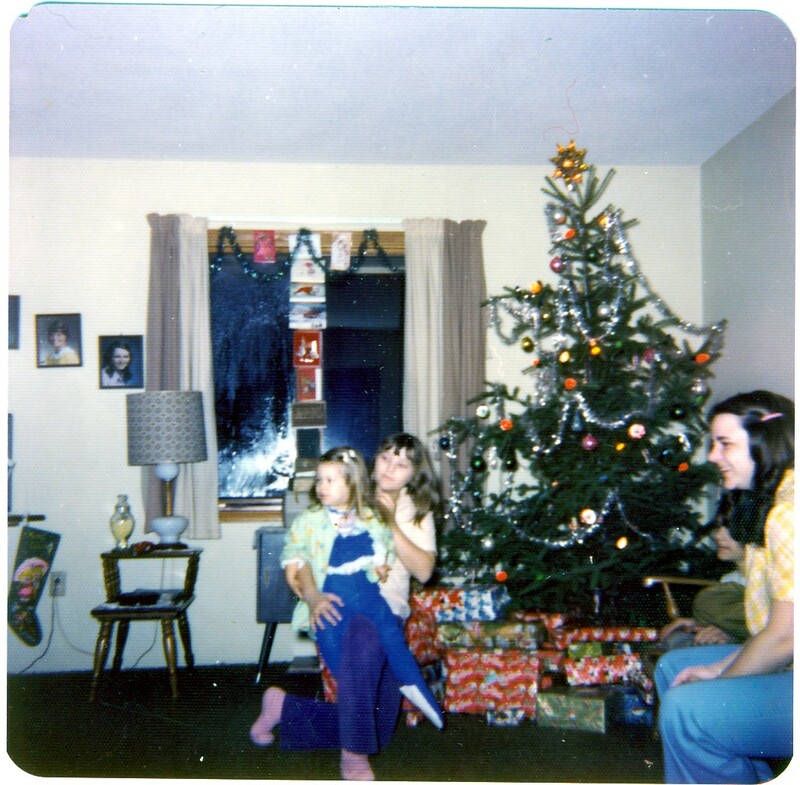 The photo below is me at age three and a half with my youngest aunt (nine and half years older than me), Karen, and the aunt who’s also my godmother, Carolyn. 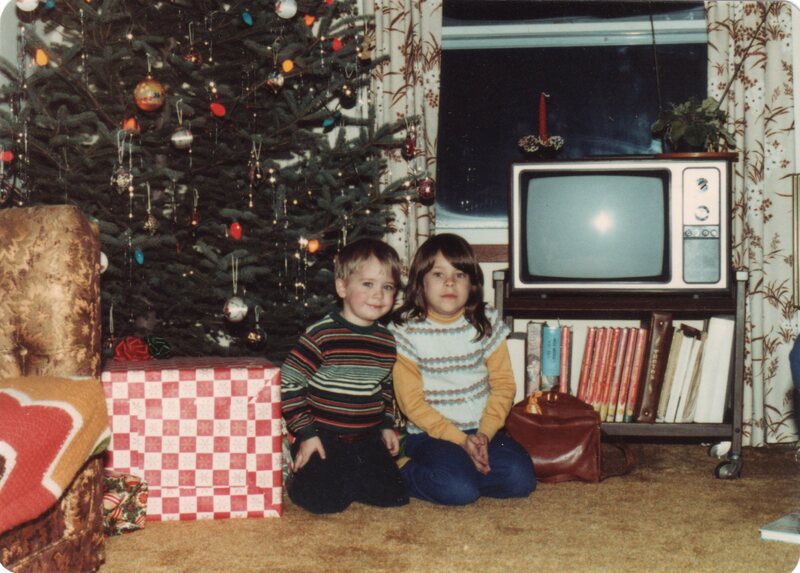 Here’s another one of my brother and me, but in front of Aunt Carolyn’s tree a few years later after she was married. I believe my paternal grandfather (Strum) and his wife (my grandma died several years before I was born, and grandpa remarried when I was pretty little yet, but I never considered his second wife to be a grandma) had real trees when I was younger, perhaps a bit smaller than my other grandparents’ trees. They also could have cut trees from their own property for all I know. With little notice, Mom hasn’t found photos from their house yet…I really should keep up better with these things! So, I’m moving right along in the Boston University Online Genealogical Studies Certificate Program. It is far more time-consuming than I realized it would be (see: lack of blog posts and social life…well, okay, the lack of a social life was a preexisting condition), but I seem to be doing pretty well so far, and I’m feeling good about being able to do professional client work someday. But that day is not yet here, and I’m not sure when it will be, though the extra income would be extremely welcome right now. So I’m trying to figure out what steps to take next, and hoping some professional genealogists out there might be willing to provide a little insight. I am definitely planning to participate in ProGen at some point, but I’m trying to figure out when I should get myself on the waiting list, since I have no idea how long it takes from the time you sign up until you actually get assigned to a group. If it’s six months or a year, I should probably get on the list now, but of the suggested criteria, I’m still short in one major area, visiting and utilizing at least four brick-and-mortar repositories. I’m working on plans for that, and should have at least a couple visited before the BU program is over, and with any luck I’ll identify and visit more. I’m wondering if it would be beneficial to take the NGS Home Study Course. Well, I’m sure it would be beneficial, but should I plan on taking it ASAP, or just someday? I am planning to go through BCG certification, but I’m not sure how soon I should start the clock. After the BU program ends mid-December, I’m hoping to be able to spend some time assessing what projects I might be able to tackle for the items needed for my portfolio, start determining what information I need, and maybe even begin some preliminary writing. I have a couple of half-baked ideas already, but mostly I just want to make sure I don’t start the clock too soon. Though I’m not sure when I’ll be ready to take on clients (and how will I know, exactly? ), I’d love to be able to at least help other researchers by doing document searches or perhaps other things of that level to gain some experience. The problem is I can’t necessarily do it all for free, because as it is I really need to get a part-time job to make ends meet, and wouldn’t it be great if I could work part-time toward what I eventually want to do full-time? But how do I get my name out there? I joined APG a while back, but didn’t have myself listed in the directory, thinking I should wait until I’m actually doing professional work. I saw that I could indicate whether I was interested in taking clients or not, but I wasn’t sure if I could specify the kind of work I can actually do at this point. Someone at the APG booth at the FGS conference last month indicated I should be listed regardless, and gave me the example that if he were looking for someone who could help him with finding information in Minnesota, he can’t ask me if I might be able to help if I’m not listed. Excellent point, but I’m just not sure what the expectations are if you’re listed. So many things to think about! Yes, just one week until I’ll be at my first genealogy conference, FGS 2011. I suspect the week (two days of travel and four days of conference is nearly a week, anyway) will be overwhelming, both educationally (and this is besides the fact that during the conference it’ll also be the first few days of the BU certificate program) and people-wise (ah, the life of an introvert), but that’s why I took an extra day off after returning, right? Hmm. I hope one day is enough. As far I can recall, I’ve never been to any kind of conference, and I haven’t known for very long that I could attend this one, so I’m trying to prepare as best I can. I’ve been to a couple of Stampin’ Up! conventions, and I imagine there are a few similarities, but this is still very new territory. Biggest question: What to wear? I’m guessing it’s probably business casual, and I have very little that fits that bill, since I pretty much wear jeans to work every day. As long as it’s warm enough I’ll be okay with some nice capris I bought for those SU! conventions, but then I have to figure out shoes. I’m all about sandals from about April to October, but I don’t have any that really qualify as “nice.” Ah, well, I still have a few days to figure it out. More than wearing the right clothes, though, I fear being intimidated by all the folks who have so much more experience with genealogy than I do. Will I even be able to keep up with conversations, let alone participate in them? But hey, I’m going to be there to learn, so as long as that happens, it’s all good.